The rumors around the league are that the Padres want Noah Syndergaard. They just completed a trade with the Cleveland Indians in which they landed catching prospect Francisco Mejia. Mejia was the top prospect in the Cleveland system. This means that San Diego now has ten prospects who are on mlb.com top 100 prospect list. Should the Mets do business? Fernando Tatis Jr. is arguably the best prospect in baseball. San Diego has a tortured history on the trade market. The last two NL champions each benefited from trades with the Padres. The Padres traded Yasmani Grandal to the Dodgers for Matt Kemp prior to the 2015 season. While this was bad, it pales in comparison to the time they traded Anthony Rizzo to the Cubs for Andrew Cashner. I could go back farther to when they traded Ozzie Smith to the Cardinals. I could also bring up the time when they traded Roberto Alomar for Fred McGriff only to send McGriff to Atlanta couple of years later. However, I won’t since there is no reason to be cruel. The Padres are notorious for misevaluating talent. They love acquiring big names even when there is no plan. Prior to 2015, the Padres brought in Justin Upton, Matt Kemp, Will Middlebrooks, Wil Myers and Derek Norris. They ended up 74-88 and only Wil Myers lasted until opening day 2017. Prior to this season, the Padres brought in Eric Hosmer. He has regressed tremendously and San Diego has the worst record in the NL. To make matters worse, the Padres also reacquired Chase Headley from the Yankees. The only logical reason they would do something so dumb, was that they felt generous and wanted to take his salary off the Yankees payroll. It isn’t hard to rip the Padres to shreds, so let’s leave it at that. The 2015 Padres were champions of the offseason, but regular season busts. *Anderson Espinoza is recovering from Tommy John. The bottom line is that the Padres have a fantastic minor league system. While the odds of all these players becoming stars is very slim, conventional wisdom is that about half should be good ballplayers. Finally, we must ask the hardest question of all. 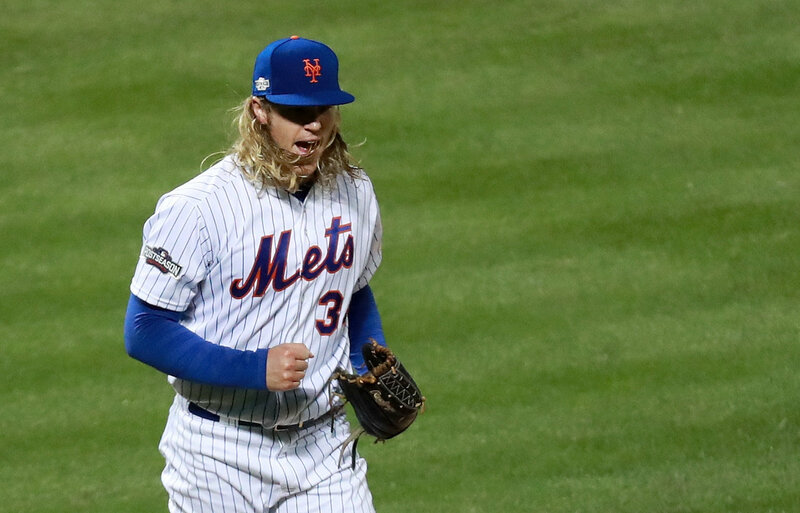 Is Noah Syndergaard tradeable? Are the Mets willing to part ways with their 25-year-old fireballer? The case against trading him is obvious. He was fantastic since the moment he came up in 2015. The following season he emerged as one of the top pitchers in the game. He has dominated in the postseason. His 2.89 career ERA and 2.69 FIP are both fantastic. Thor is a social media wiz and he is a star who can handle the big city heat. Toss in the fact that he hits well and there is a lot to like. This season he has been excellent… when healthy. Since 2017, health has been an issue. He excessively bulked up prior to that season and tore his lat muscle. This season he was healthy until he strained a finger. A couple days ago, he was sidelined with hand, foot and mouth disease. This situation has baffled many. Regardless, the real flaw is his pitching style. The Thor critics say that he is a thrower, not a pitcher. Thor can pound away at hitters but he doesn’t outsmart them. He is a guy who has a tremendous fastball and attempts to blow the world away. This year, teams have figured out a strategy. Foul away tough pitches and run up the pitch count. In his 13 starts, he has pitched 74.2 innings and thrown 1,200 pitches. That means that he has averaged 5.7 innings per game and 92.3 pitches per start. Noah Syndergaard leaving a game on April 30, 2017 with a torn lat muscle. Consider the following. 143 pitchers have made at least ten starts this season. Syndergaard’s 5.7 innings per start average ranks just 48th overall. His 92.3 pitch average is 65th. Both indicate that he is not durable and doesn’t go deep into games. While he is great when he is on the mound, he doesn’t stay on it long enough. So, what is the verdict? Trade or hold. I believe that Syndergaard is tradable. However, the Mets must land at least one top position player, at least two top pitchers and another top-30 prospect. To complete the deal, it would be nice to get international pool money out of the Padres. Anything less than at least three blue chip prospects is not worth it. Next Where are these former Mets now?